Get ready to eat all you can! 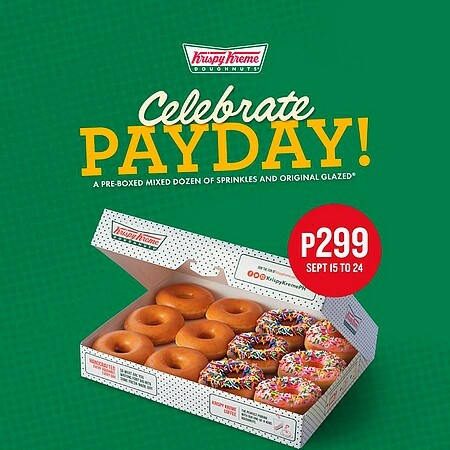 (SPOT.ph) How about a treat for yourself this week? Because it's payday and you deserve it. We've got an eat-all-you-can promo and two-for-one offers that you won't be able to resist. 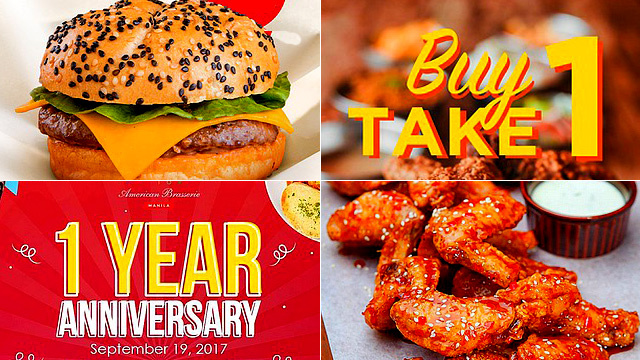 It's also Sugar Factory's first anniversary, so expect some treats. Come hungry! Ready to unwind after work with your beer buddy? 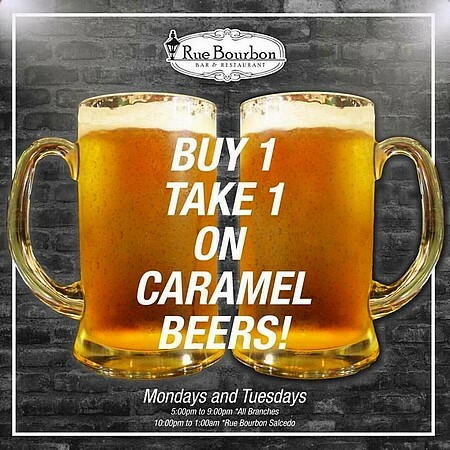 Head over to Rue Bourbon from 5 p.m. to 9 p.m. on Mondays and Tuesdays, and toast to buy-one-get-one caramel beer. At the Salcedo branch, this offer is available from 10 p.m. to 1 a.m.
Here’s to more chances to dig into the Joe’s Cheeseburger for just P99! All you have to do is like Army Navy’s Facebook page and present a screenshot of the promo post to the team upon ordering. No sweat! 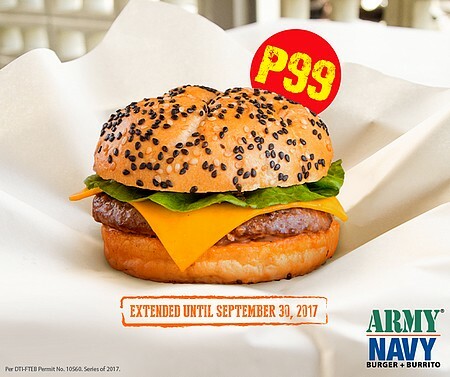 Promo has been extended to September 30. Enjoy weekends more with this promo from BONO Gelato. 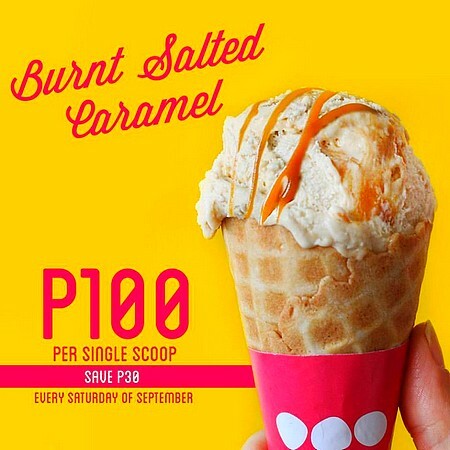 Get a single scoop of the Burnt Salted Caramel flavor for just P100 (that’s 30 bucks less than the regular price) on all Saturdays of September. Yup, that includes today. Say hello to payday with the sweetest treat! Color your days with a pre-boxed mixed dozen of Chocolate Iced Glazed with Sprinkles, Strawberry Sprinkles, and Original Glazed Doughnuts—all for P299. Promo runs until September 24. 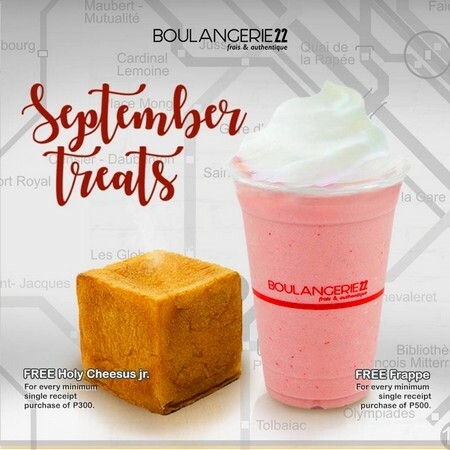 Boulangerie22 has treats for everyone this month. Get a free Holy Cheesus Jr. for every P300 worth of purchase and a free frappe for every P500 worth purchase at any branch. Time to shop for bread and pastries! 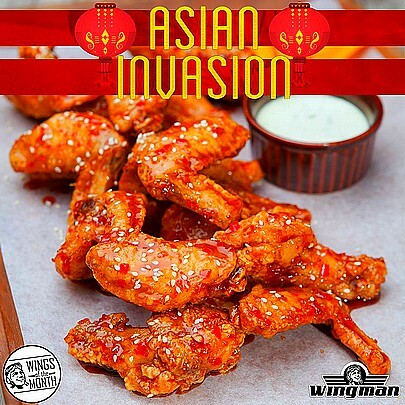 For September, the Wing of the Month at Wingman is Asian Invasion: A light, sweet glaze with subtle hints of chili and other spices from the Far East. Include Asian Invasion in your order of one dozen wings and get a drink on the house. This promo’s available until September 30. See a list of Wingman branches. For more information, log on to Wingman’s Facebook page. Here’s one food challenge that you won’t be able to resist. 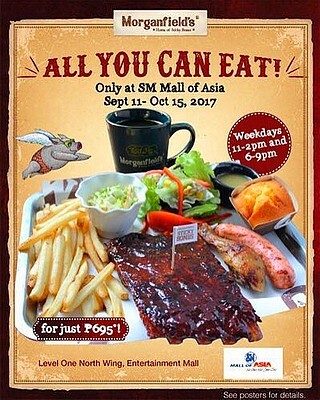 For just P695, dig into everything that you can eat at Morganfield’s SM Mall of Asia. This promo’s available on weekdays, from 11 a.m. to 2 p.m. and 6 p.m. to 9 p.m., until October 15. Morganfield’s is at G/F North Wing, SM Mall of Asia, Pasay City. For more information, log on to Morganfield's Facebook page. Buddy up and head over to Señor Pollo! 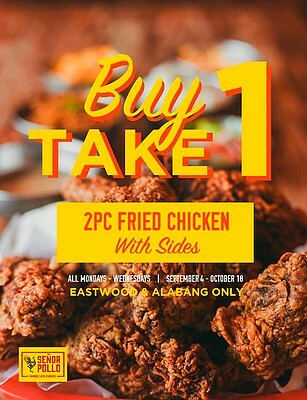 Enjoy the buy-one-get-one promo on fried chicken with sides from Monday to Wednesday until October 18. 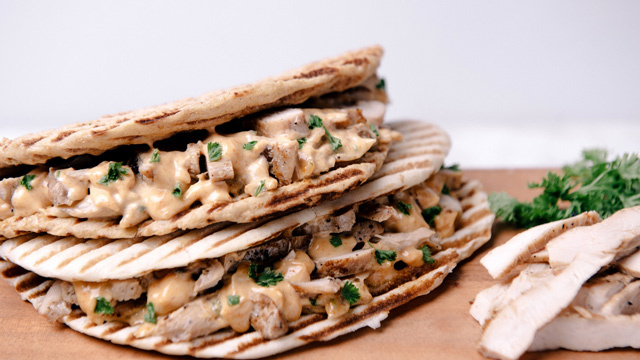 Trust us: You won’t regret the chicken. Señor Pollo is at Eastwood Citywalk 1, Libis, Quezon City; and G/F ATC Corporate Center, Alabang, Muntinlupa City. For more information, log on to Señor Pollo’s Facebook page. This season's Choose Any Two is perfect for you and your date. Take your pick from any of Pancake House’s irresistible pairings that are sure to hit the spot right away: Corned Beef Hash (new meal alert! ), Pan Grilled Pork Belly, Two-Piece Classic or Spicy Pan Chicken, Special Salisbury Steak, and Seafood Croquete. 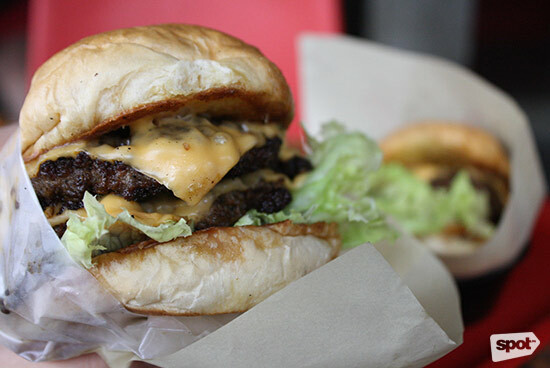 Enjoy any two of these with refreshing iced tea for just P390. Promo’s running until October 31. See a list of Pancake House stores. 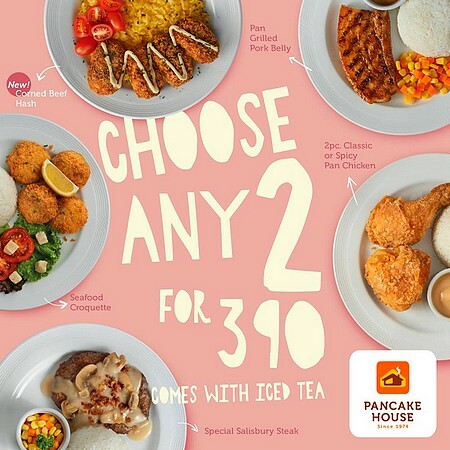 For more information, log on to Pancake House’s Facebook page. 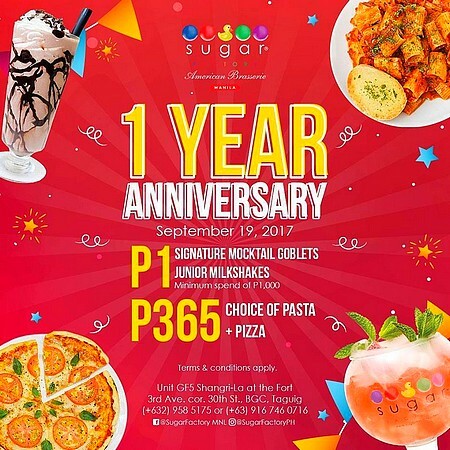 Sugar Factory will be celebrating their first anniversary and you’re invited to party on September 19! For a minimum purchase of P1,000, enjoy signature mocktail goblets and junior milkshakes for just P1. Even better: Get your choice of pasta and pizza for P365. Save the date and don’t miss these one-day-only offers! Sugar Factory is at G/F Shangri-La at the Fort, 3rd Avenue corner 30th Street, Bonifacio Global City. For more information, log on to Sugar Factory’s Facebook page.